Have you joined the campaign yet? No? What’s stopping you? I’m a recent convert and have found myself being positively evangelical about #wreathgoals2017. 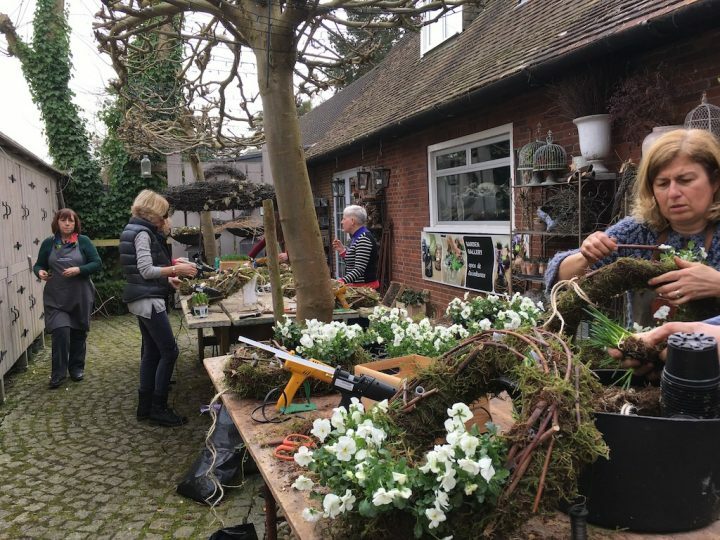 It’s a campaign that’s being championed by Alice Calcasola van der List, the Dutch floral designer who founded All In One Season in Letchworth. 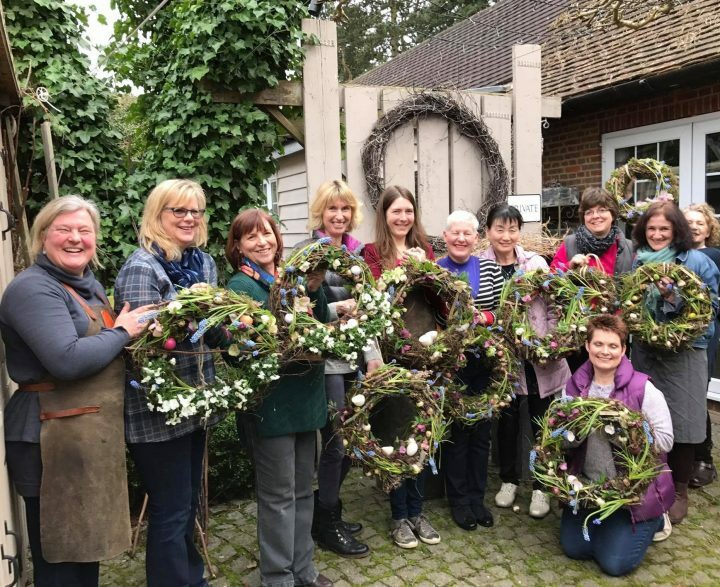 The campaign is gaining momentum, and Alice is on the cusp of transforming Hertfordshire into a county where a wreath is not just for Christmas. 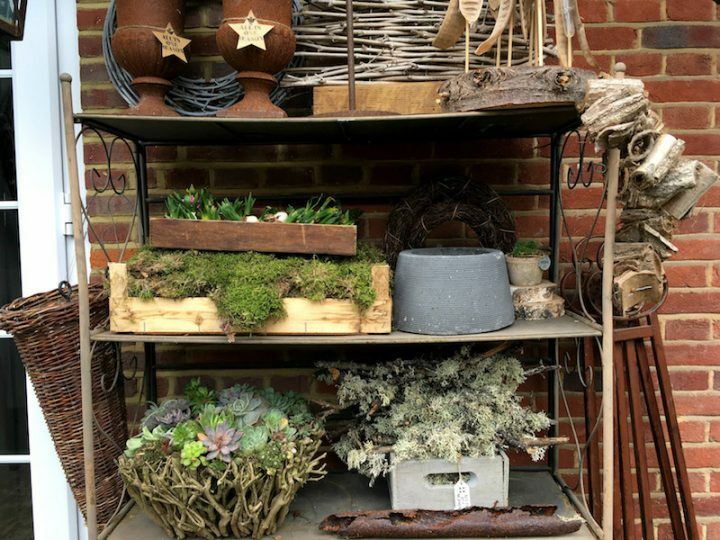 We could soon be living in a landscape of front doors where the greenery and floral wreath becomes a year-round giver of joy. 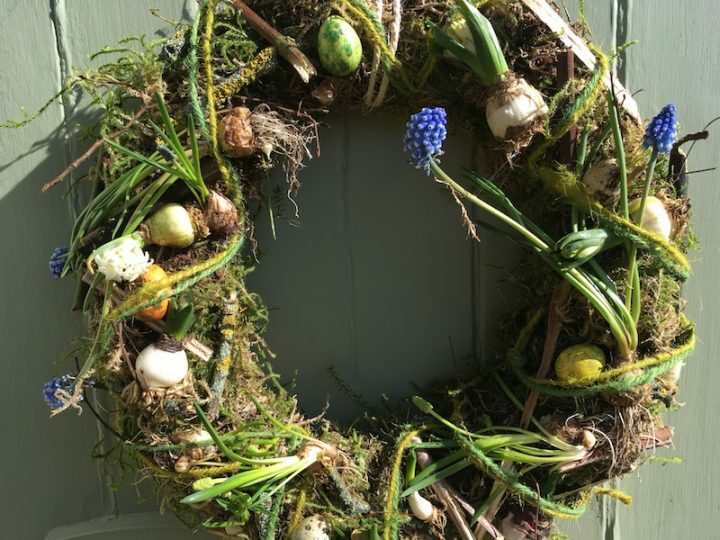 I’ve just taken part in an Easter wreath workshop at All in One Season. Perhaps that’s why I’m sounding like a zealot. Yet workshops at All in One Season, in the courtyard of Alice’s beautiful arts and crafts house, are totally laid back, and far from evangelical. They are however somewhat transformational: you can arrive making to do lists in your head, and then not long after, you find yourself plying damp moss with your hands, and thinking that lichen is quite simply a beautiful, under appreciated thing. 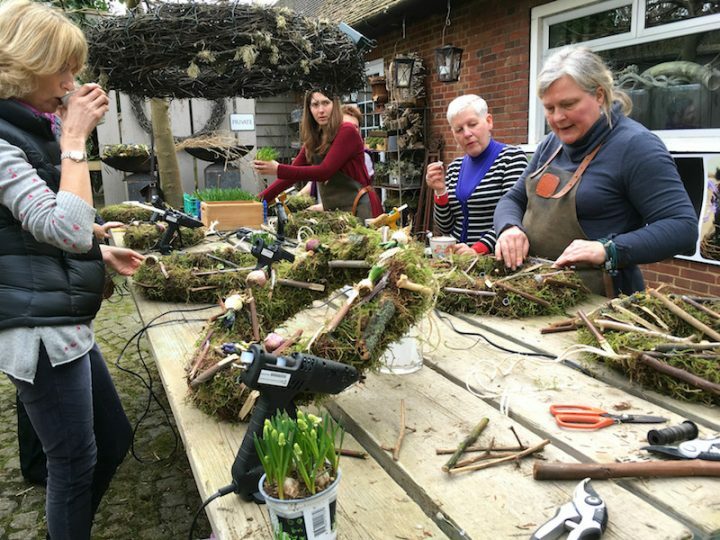 The workshop I took part in was an Easter workshop, and this weekend, on Saturday 25 March, there is one for Mother’s Day. 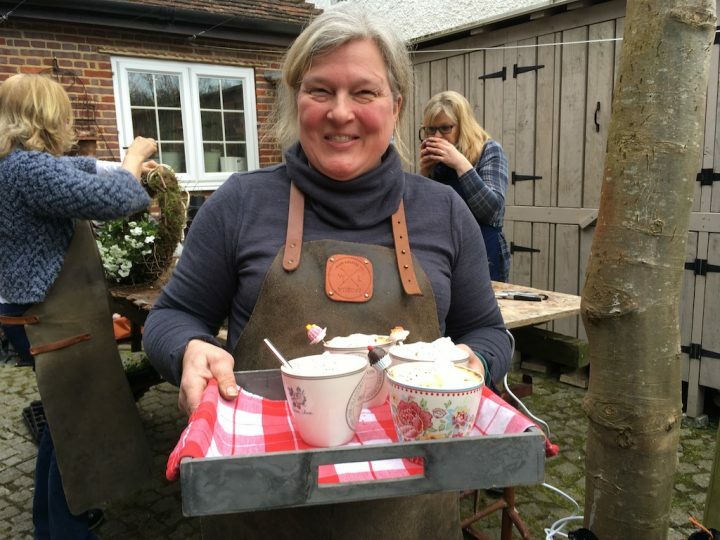 Alice runs workshops throughout the year. She is a creative bundle of inspiration and energy. It’s worth doing a workshop just to meet her. The day kicked off with Alice talking a bit about the Dutch tradition of wreaths. 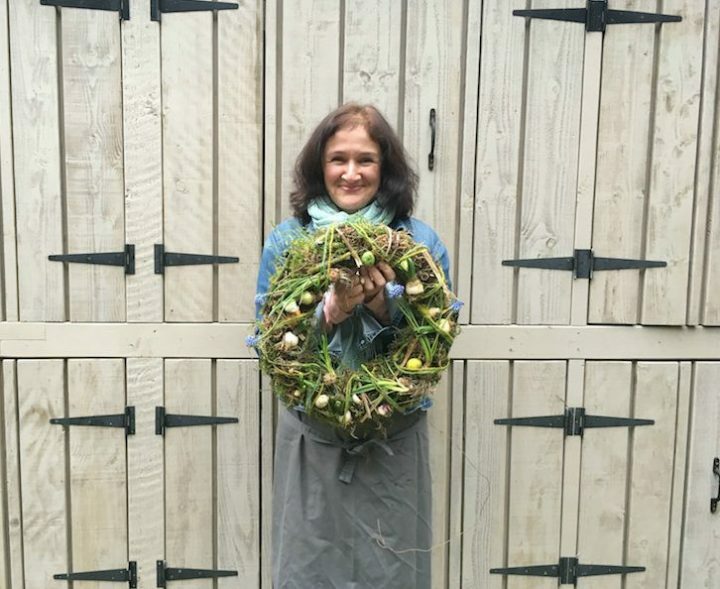 She explained that door wreaths are part of every day life in Holland, whatever the season. 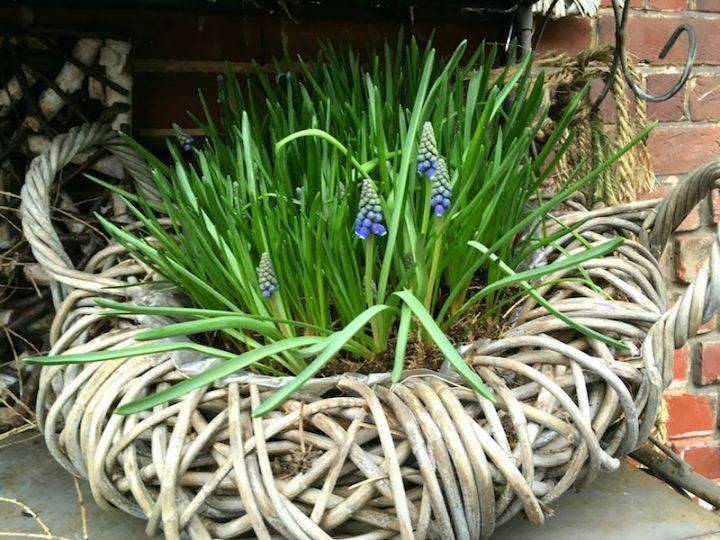 We swiftly moved on to how to build a wreath and were furnished with metal hoops and introduced to the bags of moss and other materials. This was the beginning of playtime. 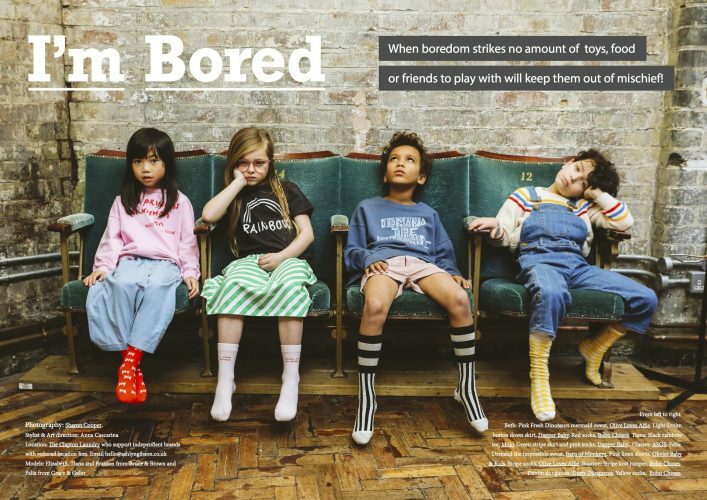 I started to remember primary school days, and the delight to be had when plunging your hands into sand or water or plasticine. 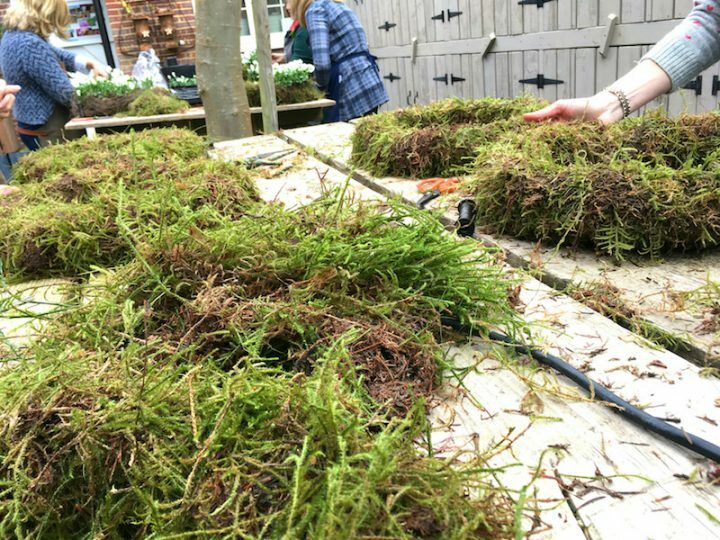 As we massaged moss and covered our metal bases, there was an organic exchange of ideas and conversation of the kind that can take place with people you don’t know when you’re all absorbed in a task. Talk flowed naturally and without any pressure to contribute. As we got more involved with what we were doing, the conversation dropped off. There was a wonderful hush as we all shared the space and communal work table while being utterly absorbed. Time passed without us realising. 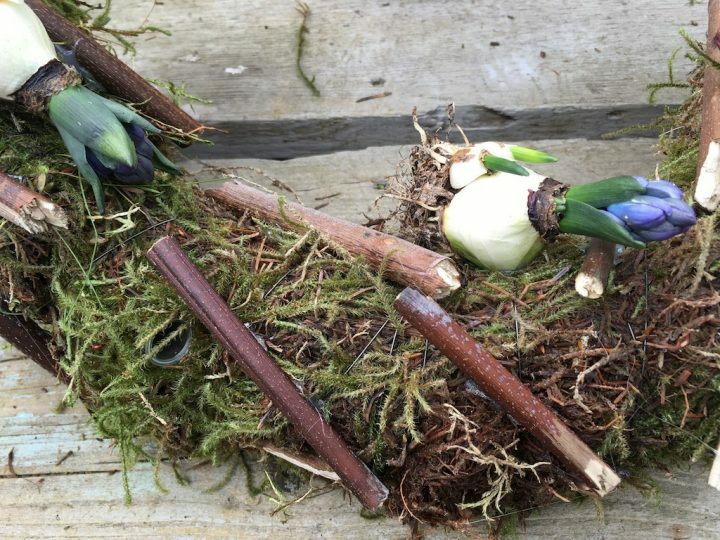 We were working with our hands; enjoying the tactility of earth, moss, onion-skin bulbs, wood, lichen and flowers, spirally tendrils, eggshells, feathers and felty string. In the zone, we switched off from the usual barrage of thoughts. Everyone fell in love with lichen. I won’t embark (sorry) on an ode to lichen, but it has qualities that need to be celebrated. Alice is a teacher with a light touch. She offers inspiration, guidance, and practical help, but essentially she gives people permission to play. She told us that she has has built up relationships with local schools including St Francis’ College and Highfield School, and that students come to her for work experience and some come to her house to do classes in the evening. 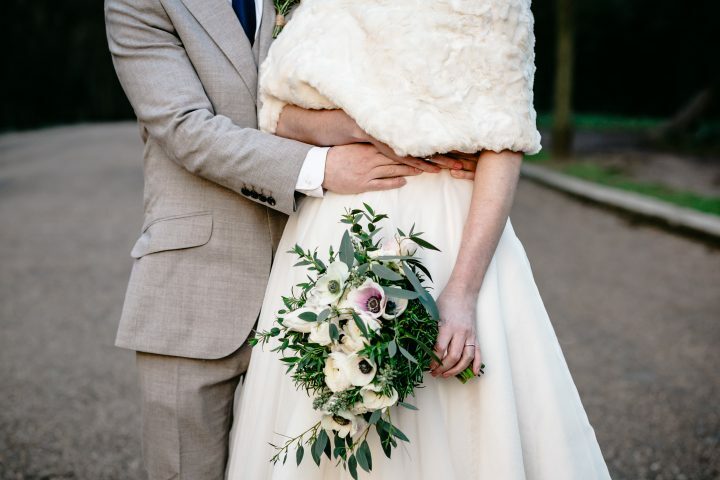 Alice also does flowers for weddings and other celebrations. Have a look at her website. 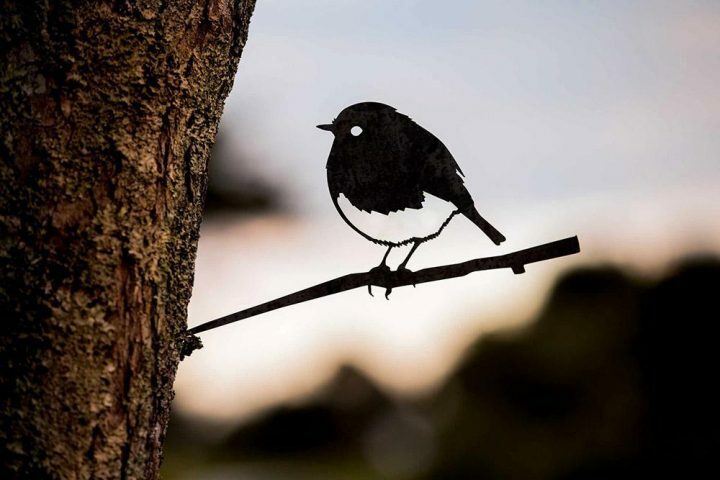 Some of the people in the workshop had been before, and more than once, and they explained – not that they needed to – that spending the day here was a way of giving themselves the opportunity just to be, and to have time to themselves. As with all the best things, it was the process that counts, although the results were wonderful. Welcome home. Paint colour? Lichen. 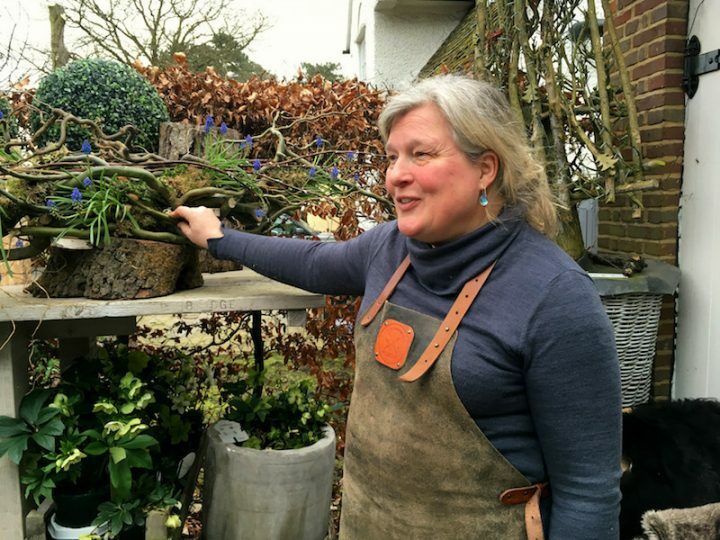 The Mother’s Day workshop with Alice is on Saturday 25 March. There is a family Easter workshop on Saturday 8 April. 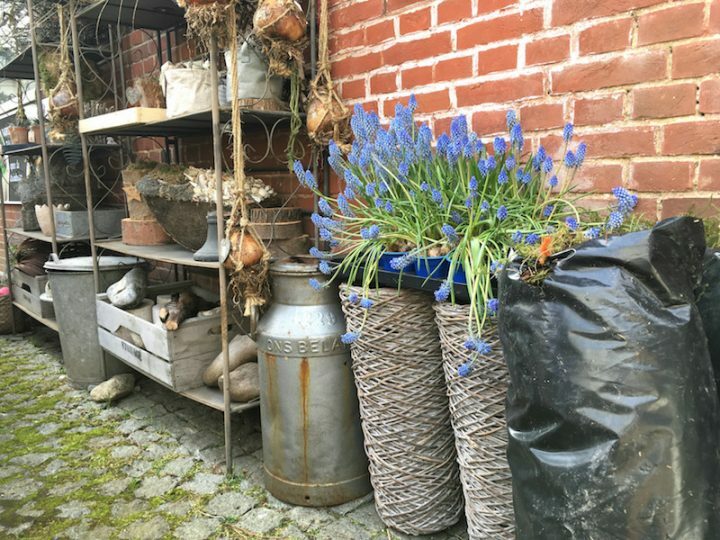 Alice also has an indoor workshop, in case of rain.